Most Americans believe smartphone screen time addiction is a real problem, and with 90-percent of people sleeping with their devices within arm’s reach, there may be some truth to it. But while many Americans assume that millennials are the ones constantly glued to their devices, a new study revealed there’s greater similarities between generations than we realize. 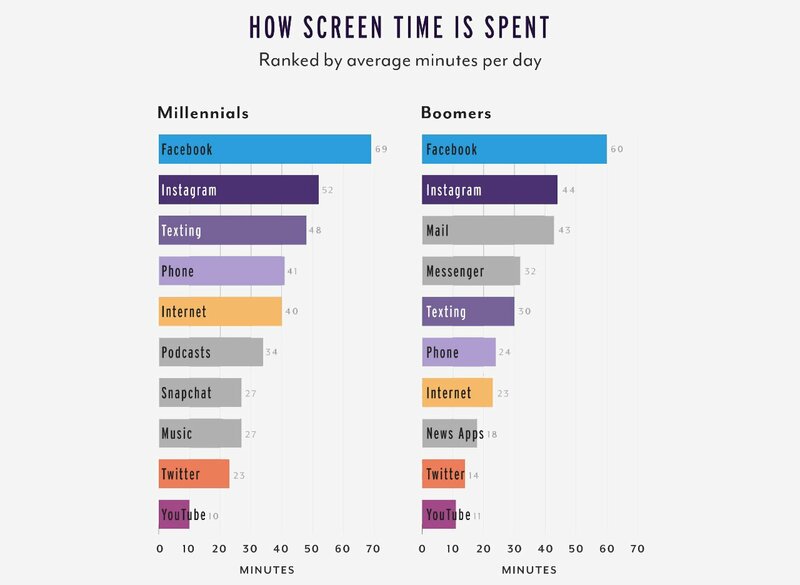 Provision Living asked 1,000 millennial and 1,000 baby boomers to go into their smartphone screen time settings and record the actual time they spent on their devices, and on their top apps over the past 10 days. From there, researchers were able to determine respondents spend an average of 5.4 hours a day on their smartphones, with millennials spending an average of 5.7 hours and boomers spending an average of 5 hours. While roughly half of millennials (48%) spend five hours, or more, on their devices daily, baby boomers aren’t far behind. The study found that 37-percent of baby boomers spend at least five hours a day on their device. Only six-percent of millennials and five-percent of boomers record fewer than two hours of screen time each day. The top time-sucking apps for both generations include Facebook and Instagram: millennials spend an average of 69 minutes a day on Facebook and 52 minutes on Instagram, while baby boomers spend 60 minutes a day on Facebook and 44 minutes on Instagram. From there, millennials spend more time texting and talking on their phones than boomers. Millennials also spend more time using their phones to listen to streaming music apps like Spotify and Pandora. Boomers, on the other hand, spend a greater share of their smartphone screen time on email and Facebook Messenger. According to the study, boomers spend an average of 43 minutes a day in various email applications, and 32 minutes a day using Facebook Messenger. However, both generations spend the least amount of time on Twitter and YouTube, with less than 34 minutes averaged across generations. But do people realize how much time they spend starting at their screens? One-in-three survey respondents said the expected their total screen time to be less than it was, according to the study results. However, knowing just how much time they spend on their devices doesn’t seem to faze many. Roughly two-thirds of respondents said they won’t cut back on phone usage, even knowing what the realities of it are. Are smartphones the addiction of the future? The majority of people (roughly 60-percent) say their smartphone is their primary internet device over laptop and desktop computers. These tiny, pocket computers travel with us everywhere—from work and public transit, to our bedrooms and public spaces—and with more applications coming out every day to distract, entertain, and consumer our attention, there’s likely no end in sight to smartphone screen time's popularity. Some companies are coming out with ways to draw attention to user phone use, like Apple’s notifications on whether its users are using more or less screen time than they have in previous weeks, but this study reveals that knowledge doesn’t necessarily empower people to change their habits. In 2019 people are addicted to their smartphones, but they don’t seem that worried about it.